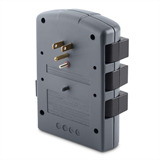 6-Outlet Pivot-Plug Surge Protector is rated 2.3 out of 5 by 3. Protect your sensitive electronic devices from surges and spikes with the 6-Outlet Pivot-Plug Surge Protector. This 1080-joule surge suppressor features six surge-protected outlets that provide powerful protection for your professional workstations, laser printers, broadband modems, home theater systems and everyday household electronics. 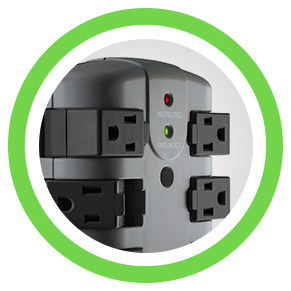 With the 6-Outlet Pivot-Plug Surge Protector, you never have to worry about power spikes, storms, voltage fluctuations, or transient electricity from damaging your valuable devices. Intelligent built-in voltage sensing circuitry detects and responds to your device's power needs, while safety features, such as thermal fuses that power off your system in the event of a severe occurrence, ensure that your devices are protected. 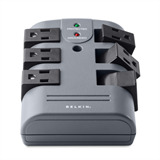 This six-outlet surge protector reduces electromagnetic interference (EMI) and radio frequency interference (RFI) to block unwanted line noise up to 40 dB, ensuring better performance of connected equipment. It also helps prevent equipment lockup. 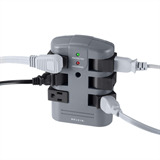 Ideal for homes, offices, entertainment centers, or any room with multiple electronic devices, the 6-Outlet Pivot-Plug Surge Protector power strip has a slim space-saving design. All the outlets rotate to accommodate larger block-spaced power adapters, including oversized printers and charger plugs, without blocking the other outlets. 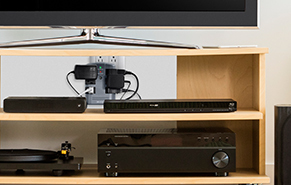 Plus, the cord management system lifts and locks to keep cables neat and tangle free. 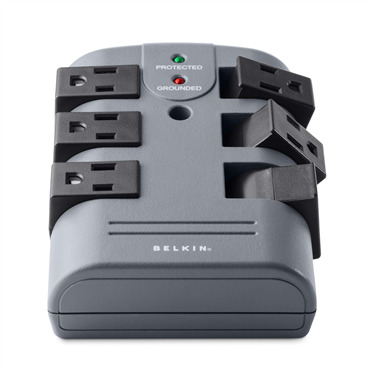 This six-outlet surge protector comes in a durable impact-resistant ABS case that protects ciruits from fire, damage and rust. 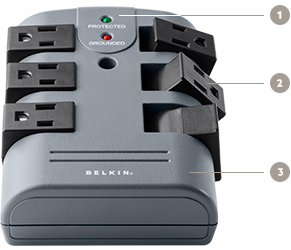 This surge protector comes with a Limited Lifetime Product Warranty and $50,000 Connected Equipment Warranty. 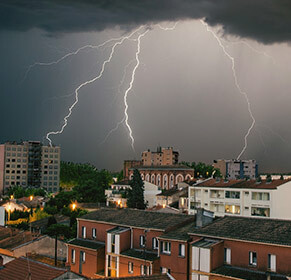 Belkin will repair or replace electronic equipment damaged by an electrical surge or a lightning strike while properly connected to the surge protector, up to $50,000. 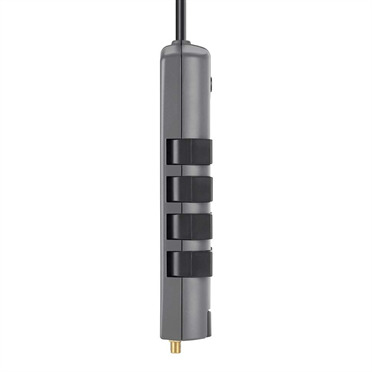 Rated 3 out of 5 by BZLadmin from Good Product with Room For Improvement Pros: Very nice and compact design that plugs straight into the wall outlet without extra cords. Good surge protector for basic, low power-draw electronics, especially by your nightstand. The pivot plugs help you fit smaller power blocks next to other power cords as long as you dont have multiple blocks next to each other. Cons: Missing USB ports, would be nice if Belkin added 2 or more USB ports at the top. Also, the distance between the pivot plugs could be increased to allow some more room; difficult to take full advantage of the pivot plugs when you have one of the outlets shifted all the way outward toward the wall. As you can see the third prong is facing outward, so larger power blocks don't always fit. Since this unit blocks both standard wall outlets, surprised they didn't take advantage of using both of those outlets for increased output. Also would be nice to have child proof outlets. Rated 3 out of 5 by RGBlues from Not bad, but be careful! These are rated at 15 amps but that is the total for the entire unit. using this with an appliance with high draw is not recommended. The individual outlets are plastic and not NEMA rated. You will notice that all your homes wall outlets are of a hard plastic materi8al. 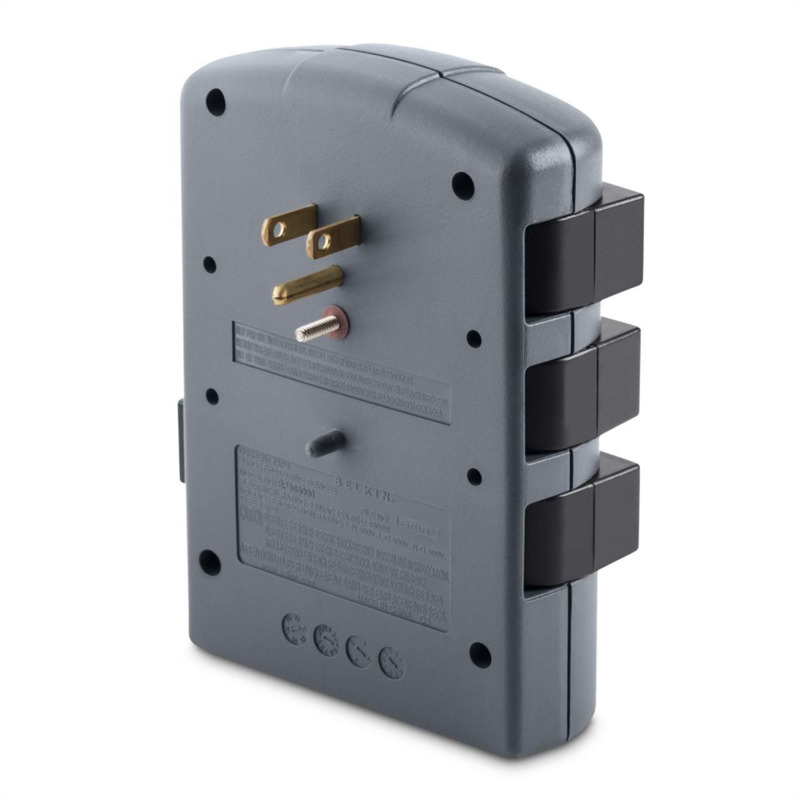 These are each rated to carry the full load supplied to the line which in most outlets is 15 amps. The problem is not the current but the heat which may be produced in certain instances. The outlets in this device can melt at that level of heat. So for an LCD monitor, some wall warts, or other low-draw devices this is a nice unit, but the use of a thermal plastic for the actual outlets is something you should be aware of. 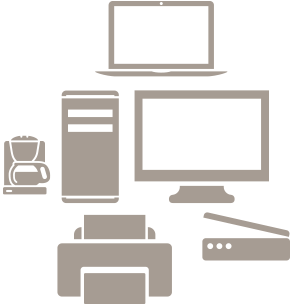 Sign up today for the latest news and product updates from Belkin. © 2019 Belkin International, Inc.